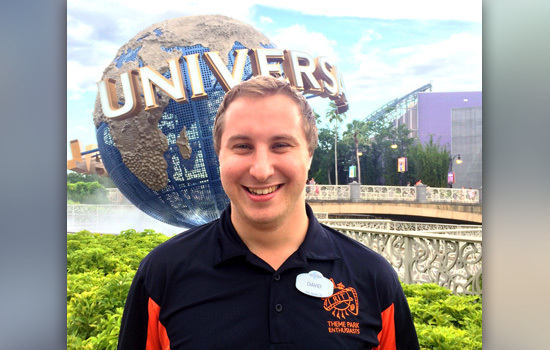 David Swerzenski '17 (mechanical engineering) helped start RIT's Theme Park Enthusiasts Club and now works at Universal Creative. David Swerzenski has always had one career goal—work in the theme park industry. Days after graduating from RIT, Swerzenski ’17 (mechanical engineering) accomplished it. He began working on a project management team in the Engineering and Safety Division at Universal Creative, the research and development group responsible for designing rides and attractions for Universal Parks & Resorts theme parks. Swerzenski has been working on a new roller coaster for The Wizarding World of Harry Potter. The ride, which is replacing the Dragon Challenge, will open in 2019 at Universal’s Islands of Adventure in Orlando, Fla. Anyone who has visited Imagine RIT: Innovation and Creativity Festival knows just how fascinated Swerzenski is with theme parks. 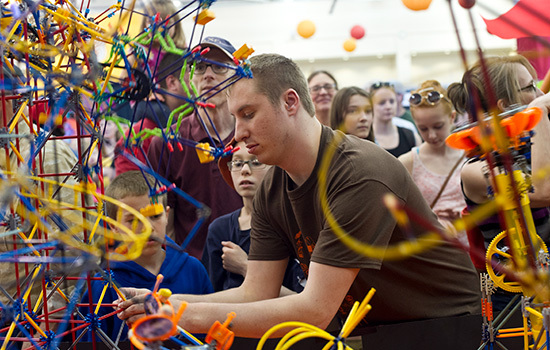 He is the guy behind RIT’s Theme Park Enthusiasts Club’s swirling replicas of amusement park rides made with close to one-half million pieces of K’NEX. Swerzenski was 22 months old when he saw his first carnival ride, he said. He was hooked. The fascination followed him through elementary, middle and high school, where he played around with his K’NEX models but didn’t publicly show them. At RIT, he and a few other students started the Theme Park Enthusiasts club. The club began in 2015 with a small Imagine display and only a handful of members. By 2017, the club had grown to close to 30 members. The Imagine display also grew in 2017 to more than 30 K’NEX rides that spanned 10,000 square feet. Last school year, the club also added a professional development component. Members listened to guest speakers, attended workshops and began competing in national design competitions. Last November, an RIT team won every award in the Ryerson Invitational Thrill Design Competition, hosted by Universal Creative. The teams had three challenges to finish, including retrofitting a Ferris wheel to keep children in open gondolas, designing a rollercoaster that couldn’t go faster than 40 mph and redesigning the Teacups ride to make it more appealing to teenagers. The RIT team, which also included mechanical engineering students Robert Cybulski, Mike Troise and Caroline Kruse, were offered internships by Universal Creative over the summer. Since Swerzenski graduated in May, his internship was changed to an externship and extended until December. Swerzenski said he will be joining Universal Creative full time after the externship is over. He has really enjoyed working with both the engineering team and the creative studio team in his current role. David Swerzenski said he will be joining Universal Creative full time after his externship is over.